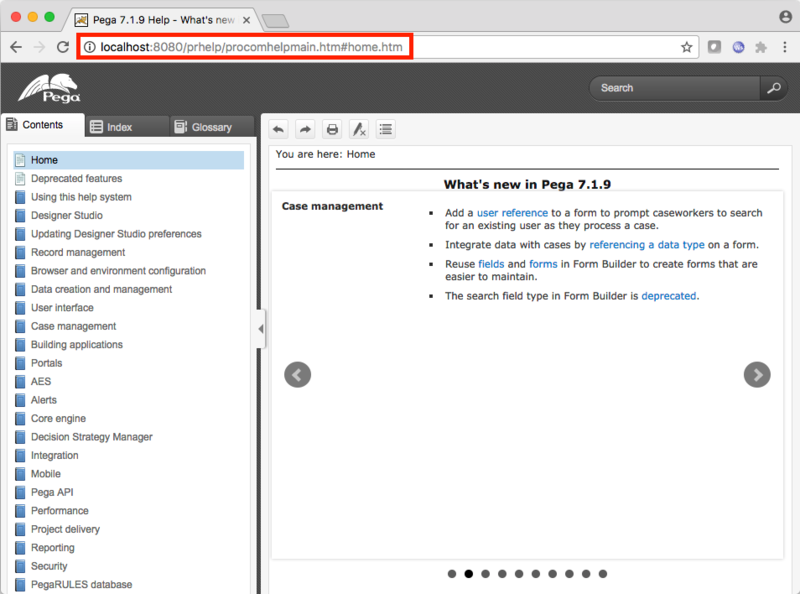 This post shows how to install the Pega 7 Exercise System on Tomcat 9 and PostgreSQL 9 – without the need for a virtual machine. Here, Mac OS X is used but the steps for Windows are essentially the same. The Pega 7 application WAR file (prweb.war) can be obtained from a Pega Exercise System installation. 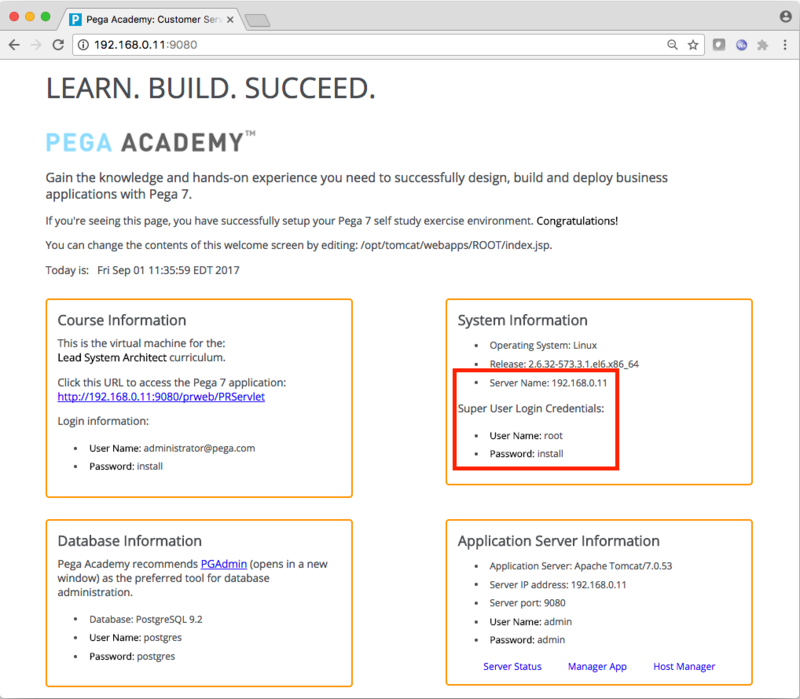 Here, a Pega 7.1.9 Exercise System is installed and running on Oracle VM VirtualBox as explained in the Pega Academy Virtual Machine User Guide. 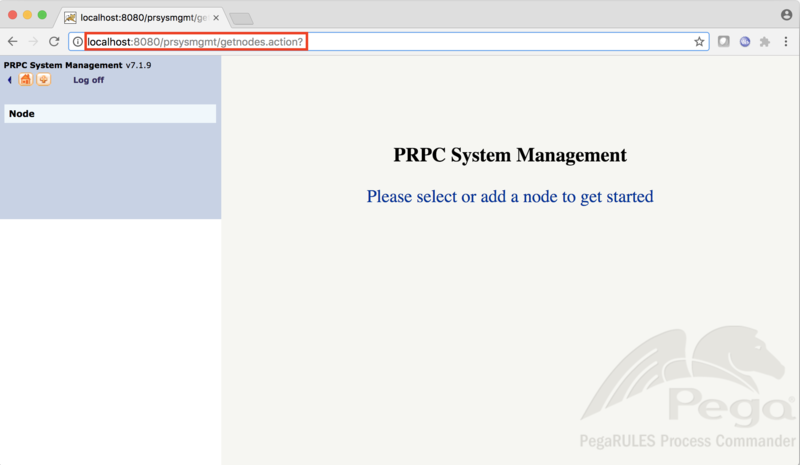 The Pega 7.1.9 Exercise System provides an index page at <hostname>:9080 that shows system information. The super user credentials are used for FTP access. Any FTP client such as FileZilla can be used to download the Pega 7 application files. 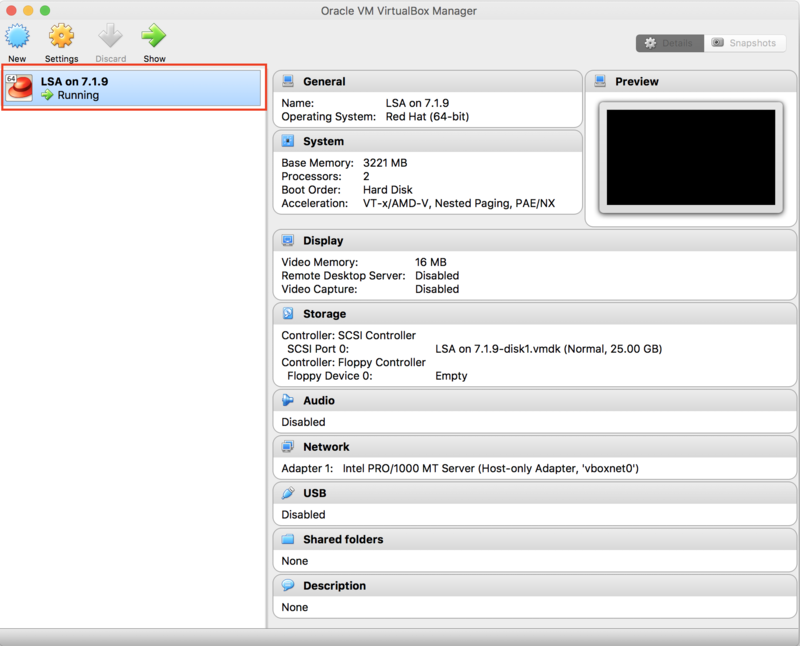 For detailed steps, see FTP Connection to Pega 7 Exercise System Running on a Virtual Machine. These WAR files will be used in section 7 and deployed to Tomcat 9 on the local machine. Use the VM command line interface to access the Pega 7 Exercise System. 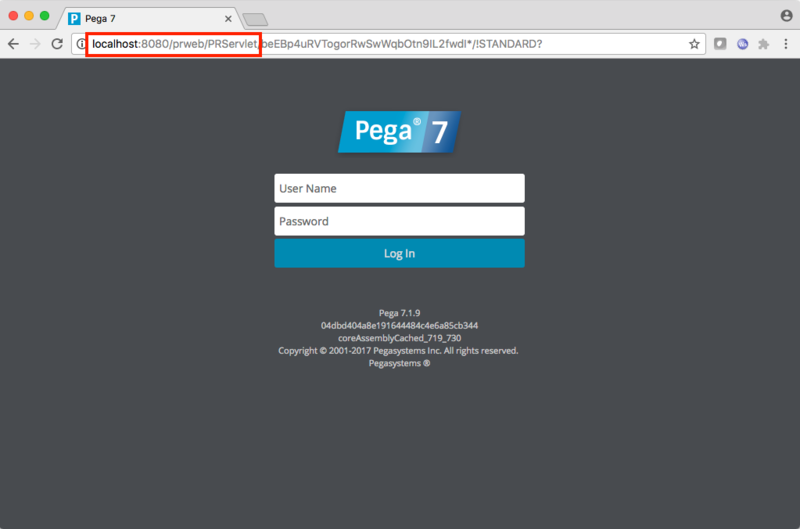 On Pega 7.1.9, the default credentials are username root and password install. Navigate to /usr/bin and execute the pg_dump program as shown below. The Pega 7 DB export may take a while and result in a fairly large file. Here it is 6.1 GB. 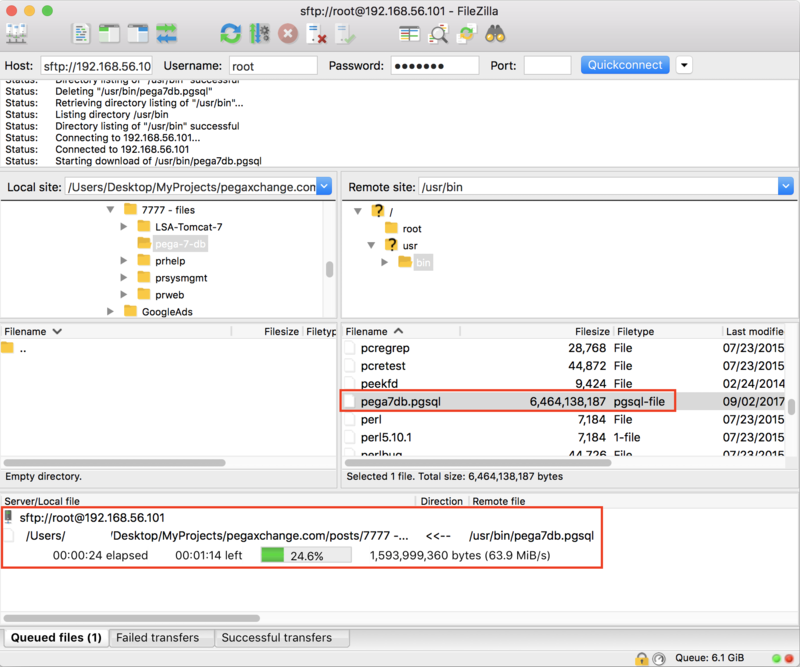 Use the FileZilla FTP client again to download the Pega 7 DB file. 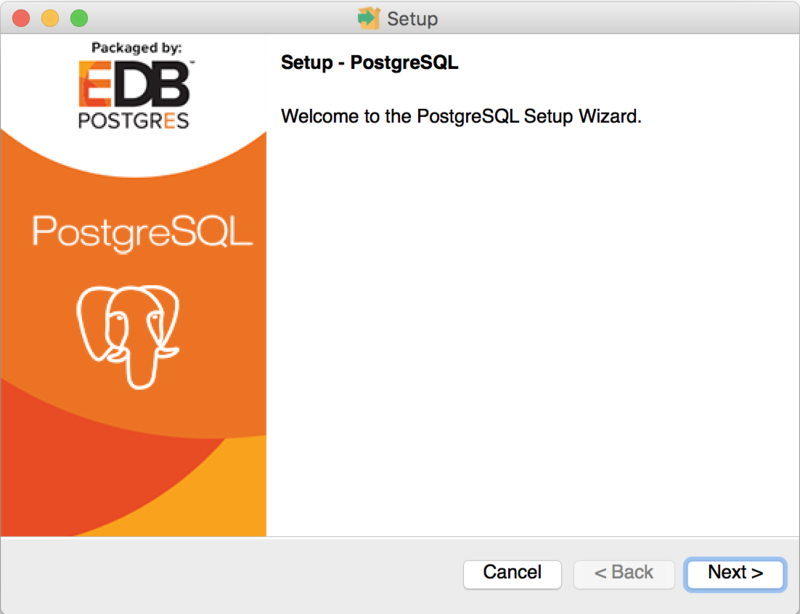 Navigate to the PostgreSQL Download Site and click on the link for your OS. 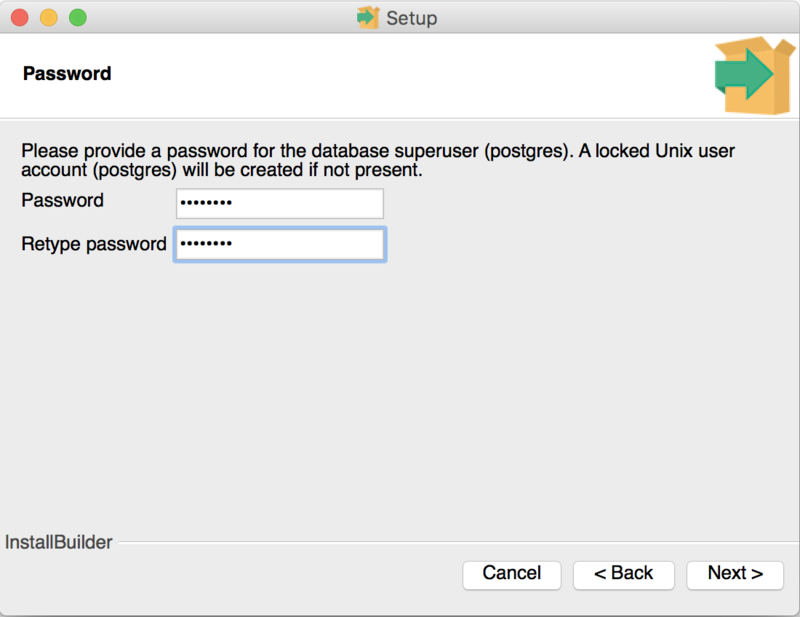 Select the PostgreSQL version and the OS from the drop downs. Here, PostgreSQL 9.6.5 is used. Run the downloaded installer file. 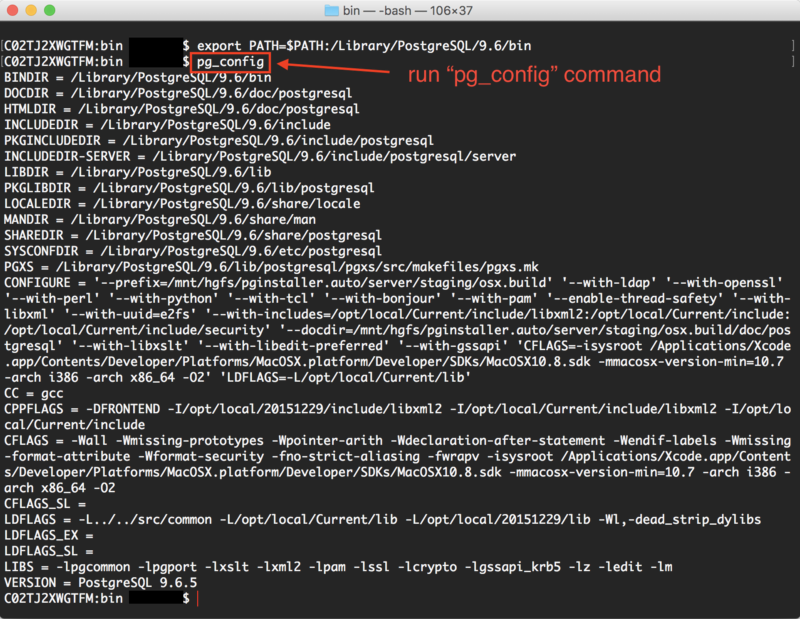 Here the file is named postgresql-9.6.5-1-osx.dmg. Follow the installation instructions. The default settings are used in this example. Enter a password and make sure to not lose it. Here, postgres is used. 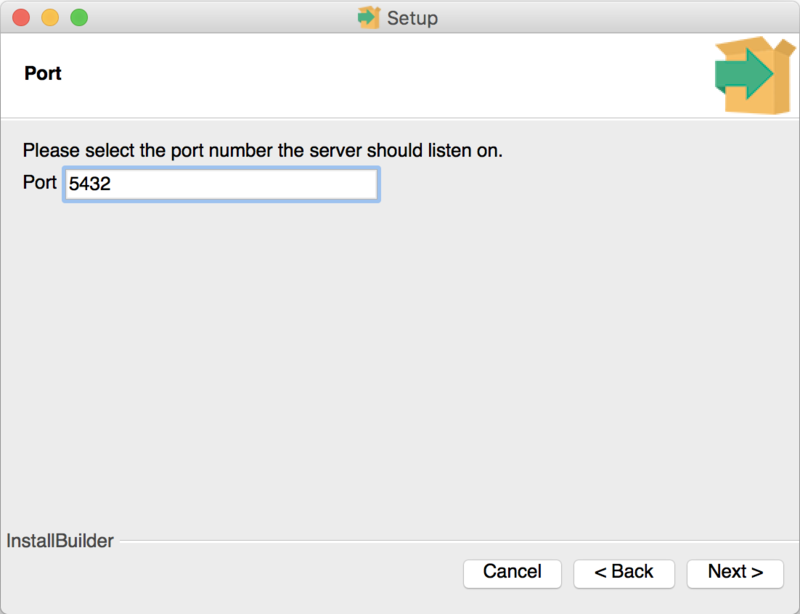 Make sure to keep the default PostgreSQL server port 5432. The installation should not take more than 5 minutes. 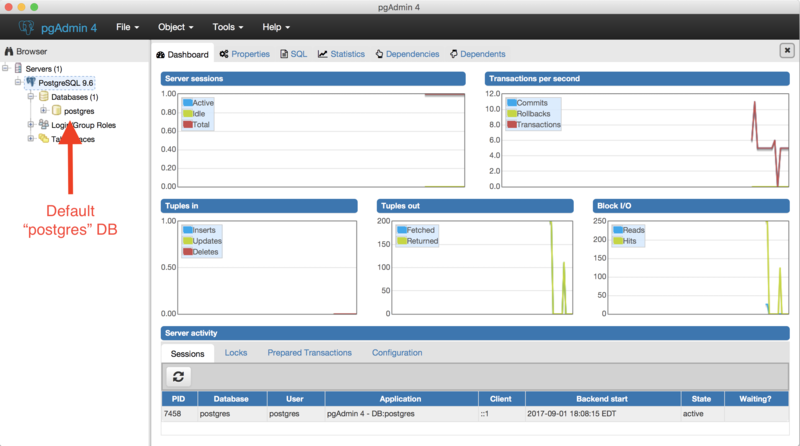 After the PostgreSQL installation, download pgAdmin. 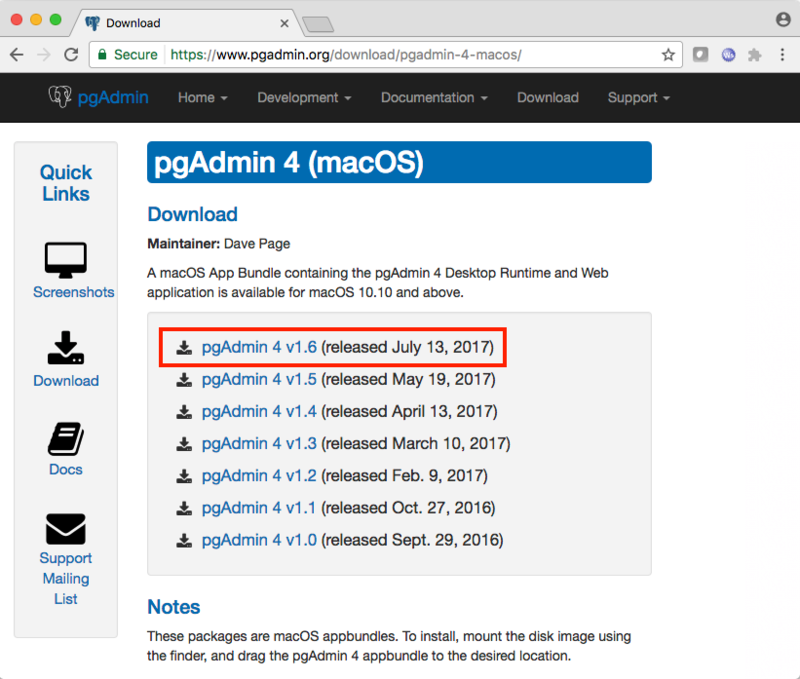 Here, pgAdmin 4 v1.6 for Mac OS X was used. Start pgAdmin. It should automatically detect the running PostgreSQL server instance. 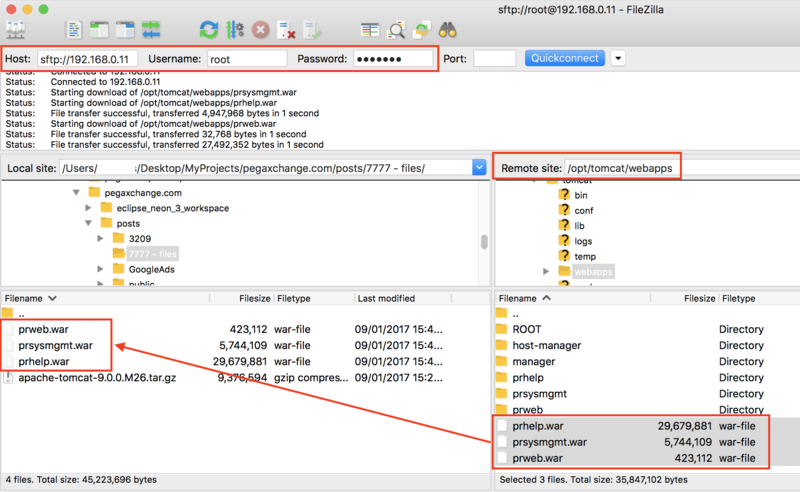 On the left-hand side in pgAdmin, expand the Servers node, right-click on PostgreSQL 9.6, select Connect Server and enter the postgres password that was set during the installation. 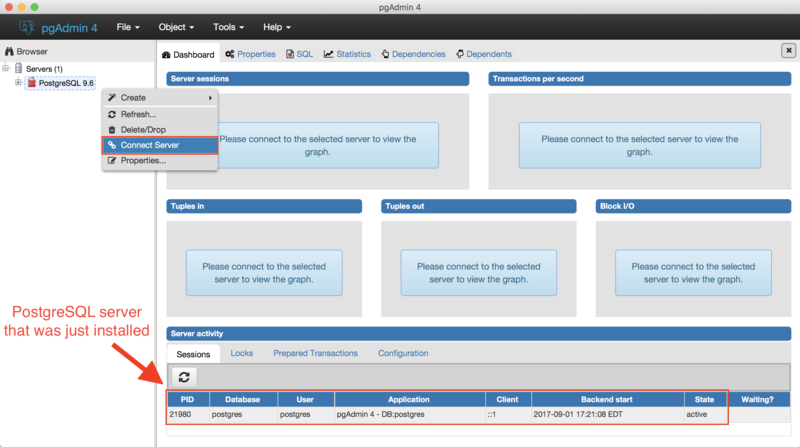 pgAdmin should now be connected to the local PostgreSQL server. The Databases node shows all databases. At this point, there will only be the default postgres DB. The Pega 7 database depends on the PostgreSQL PL/Java extension that allows procedures, triggers and functions to be implemented in Java. 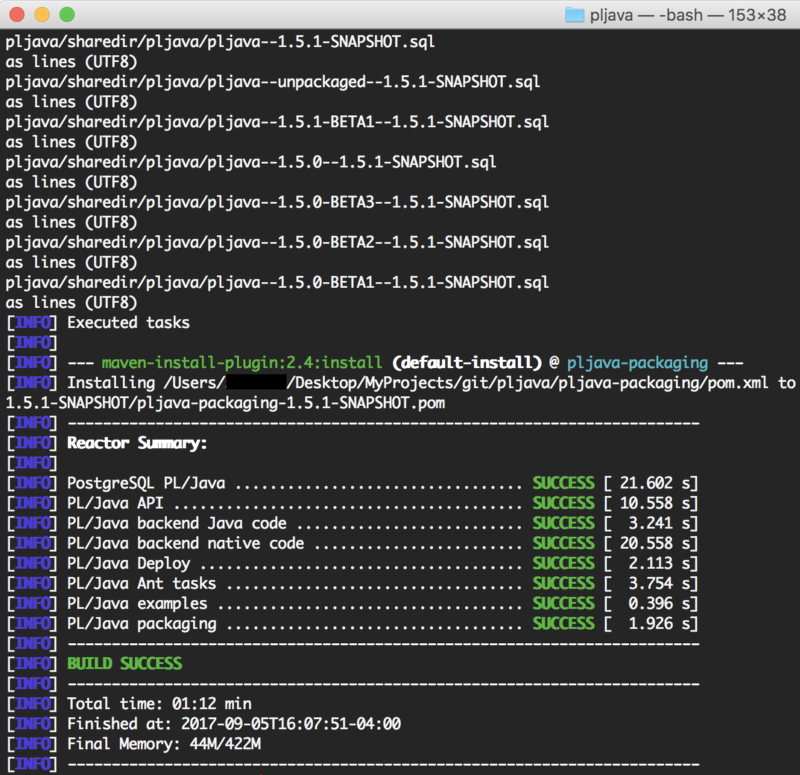 PL/Java must be built from source code using Maven. Pega 7 will not function without the PL/Java extension. Follow the steps in this section and if needed, refer to the PL/Java git hub site for details. 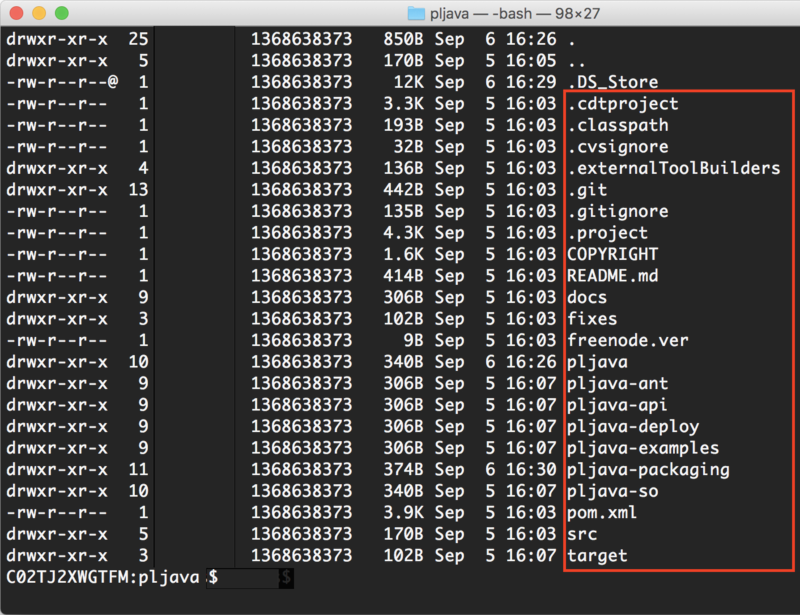 After downloading and extracting the ZIP file or after cloning the git repository, the root folder of the PL/Java Maven project should look like below. Make sure that a Java JDK is installed. Here, Java JDK 8 is used. For additional details on installing Maven, see the Maven Quick Start guide. During the build, there may be some warnings and errors related to Java types. These can be ignored. A successful build looks like the screen shot below. Refer to the PL/Java Build page for details or for information on debugging unsuccessful builds. Make sure to run the JAR file with a user that has sufficient privileges to write to the PostgreSQL installation folder. 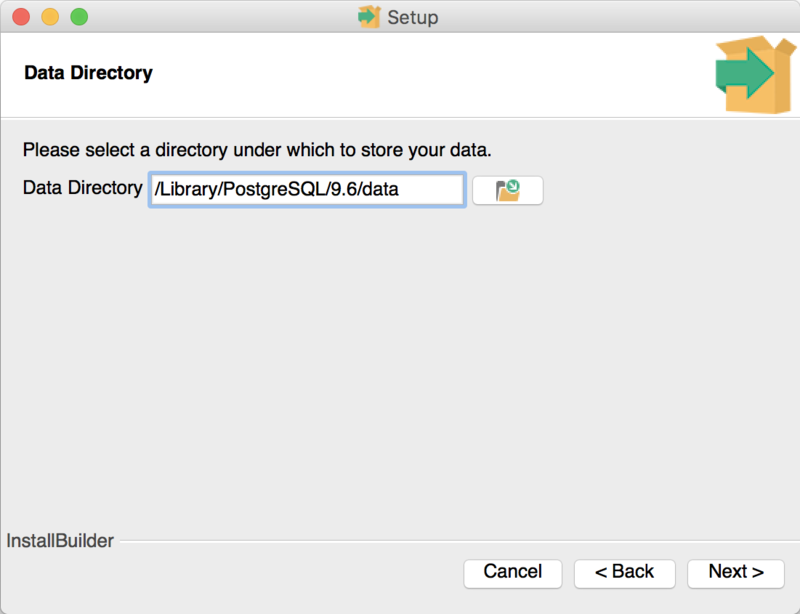 Running the JAR file creates a postgres/pljava folder in the PostgreSQL share folder and copies other PL/Java resources to the PostgreSQL installation. At the bottom, under CUSTOMIZED OPTIONS, add below lines to configure the PL/Java extension. 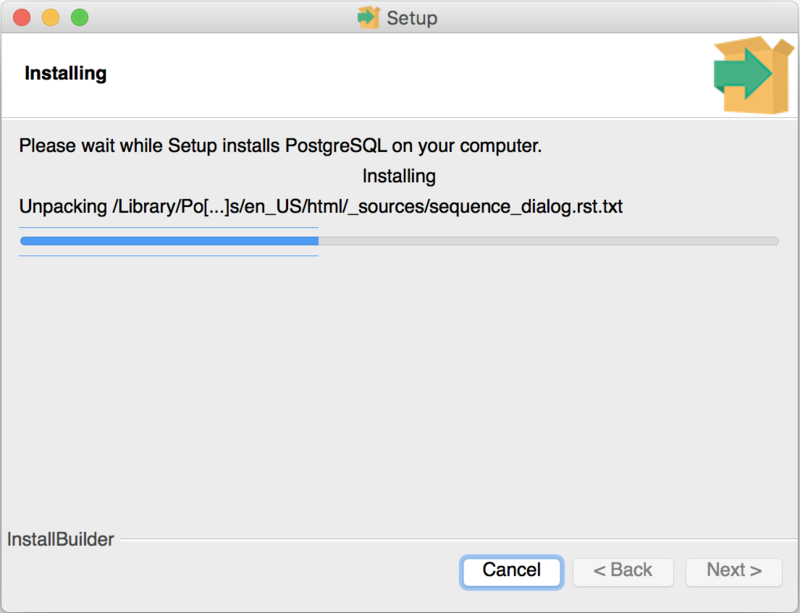 Restart the PostgreSQL server and open pgAdmin to continue. In pgAdmin, create the Pega 7 DB user named pega by executing the SQL command below. In pgAdmin, create the Pega 7 database named pega using the SQL command below. Execute the SQL commands below to configure the pega user and to set the password to pega. 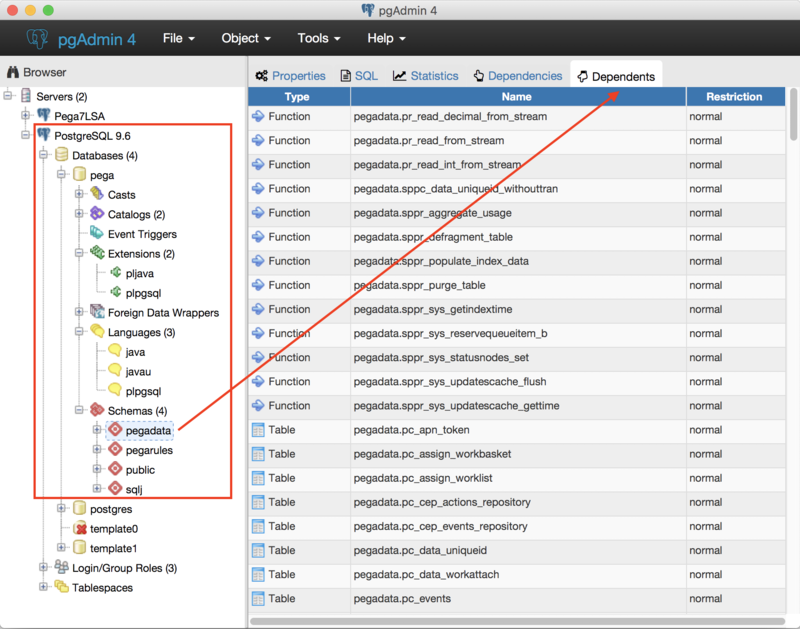 Right-click on the pega database node and select the Query Tool. 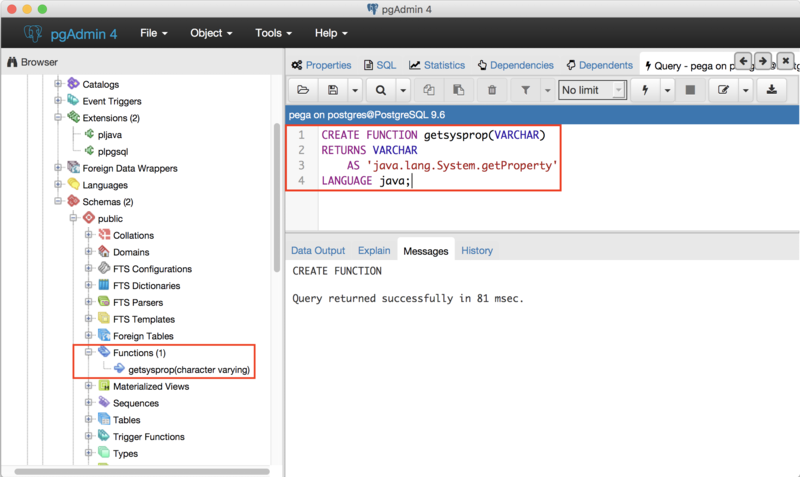 Execute the below SQL command to add the extension for PL/Java to the pega database. It should return the Java version that PL/Java is using. 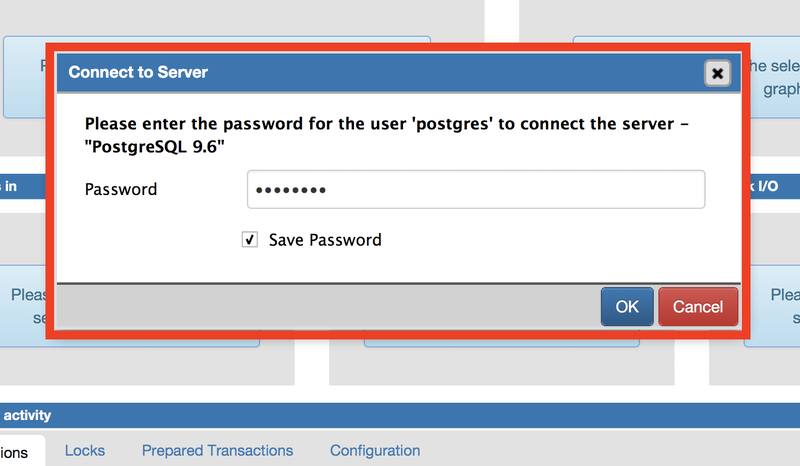 The PL/Java extension for PostgreSQL is now installed for the pega database. 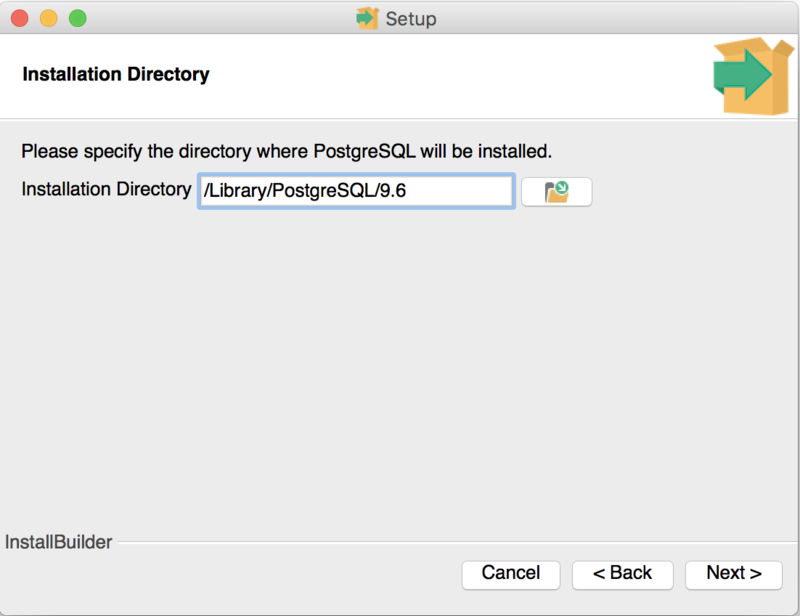 Import the file pega7db.pgsql into the local PostgreSQL instance using the psql tool. The Pega 7 database will be completely recreated by the import. pgAdmin can be used to compare the imported DB to the one on the exercise system. Navigate to the download section on the Apache Tomcat home page and select the link for your OS. Here, Mac OS X is used as the target system and the binary distribution apache-tomcat-9.0.0.M26.tar.gz is used. Uncompress the downloaded file to some folder. Here, Tomcat 9 is installed at apache-tomcat-9-A. Open a new Terminal and navigate to the Tomcat 9 bin folder. Run startup.sh to start Tomcat. In a browser, access http://localhost:8080 to confirm that the Tomcat 9 server is running. Modify the context.xml file as shown below to add the Pega 7 DB JDBC connection parameters. 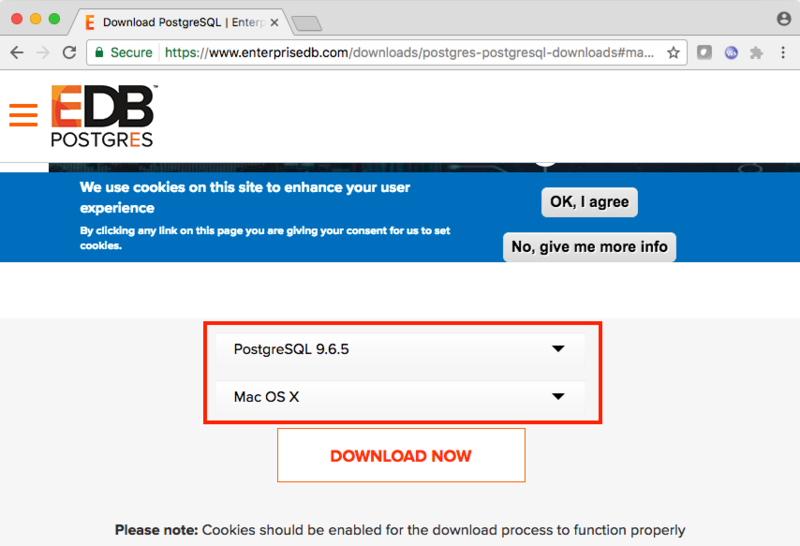 Download the PostgreSQL JDBC driver from https://jdbc.postgresql.org/download.html. For Java 8, use version 4.2. Copy the JAR file into <tomcat-root>/lib. Copy the 3 WAR files listed in section 1 into the <tomcat-root>/webapps folder. Tomcat will automatically deploy the WAR files and start the Pega 7 application. 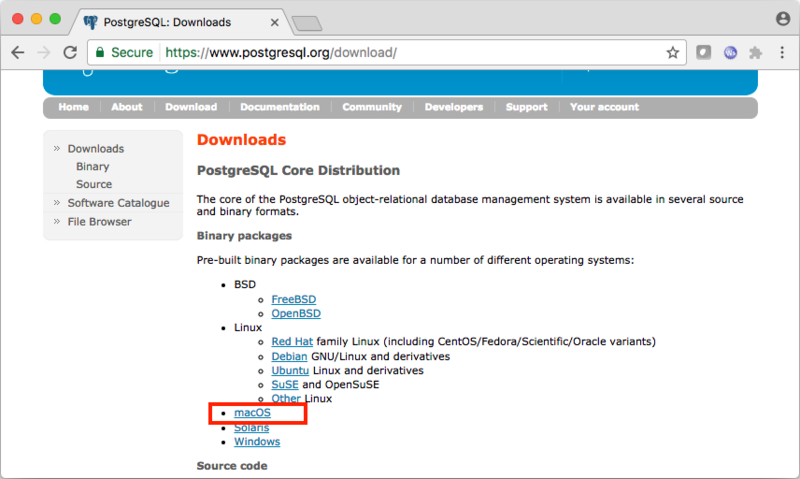 Amazing article… I am trying the steps on ubuntu 16.04 but stuck on importing the .pgsql file in the host system postgres.. however will find out something… maven build was a headache for me..
just want to say nice work mate, you have done a great job…!!! Thanks you! Appreciate the good feedback!